Q: Will you release an open source version of the plugin? A: Our plugin is built on the libjingle open-source library. At a minimum, we plan to release an updated version of libjingle. Q: What video codecs do you support? A: Today we support H.264/SVC, an extension of H.264/AVC that excels in realtime scenarios. As SVC is a superset, the Gmail client can currently decode an AVC bitstream, and clients receiving a SVC bitstream can do some minimal NAL sorting to decode just the AVC component of the bitstream. We plan to add support for sending an AVC bitstream if the remote client requests it. In the future we may also support H.263. Q: Is there a RFC for H.264/SVC packetization? A: The packetization has not yet advanced to RFC status. We are currently using one of the more recent drafts (need to check on exactly which one). We plan to move to the final version when it is available. 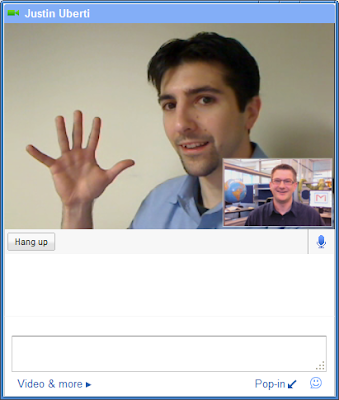 Q: How can a 3rd-party client interop with Gmail voice and video chat? A: Right now, any client that supports the Google Talk "session" extension to XMPP and a compatible set of codecs can participate in calls with Gmail voice and video chat. Now that the official Jingle specifications are becoming final, we plan to move to using XEP-0166, XEP-0167, and XEP-0180. Q: Will a desktop version be available? A: Please see this post on the Google Talk Blog. It's here! Today we're launching voice and video chat, right inside Gmail. We've tried to make this an easy-to-use, seamless experience, with high-quality audio and video. And we've built this product using Internet standards, such as XMPP, RTP, and the newly-standardized H.264/SVC video codec. This product was a lot of fun to create, and it's just as much fun to use. Check it out in the product video below, and then head on over to http://mail.google.com/videochat to try it for yourself. This is just our first version, and we have a lot more planned. We're always glad to hear feedback from users - tell us what you think by leaving a comment on this blog or sending me an email (juberti). If you really like it, feel free to say so over a video chat!